Abstract: Osteochondral allograft transplantation is a technique that was first developed to treat cartilage pathology in the knee. Over the past 15 years, this technology has been translated to the treatment of osteochondral lesions and end-stage arthritis of the ankle. For osteochondral lesions of the talus or the tibia, a fresh osteochondral allograft transplant can be fashioned to match a specific defect and is useful for large, cystic or uncontained lesions. For a young patient with end-stage arthritis, bipolar fresh osteochondral allograft transplantation is a treatment alternative to ankle arthrodesis. Evidence for these operations is limited and consists primarily of case series, which have reported variable rates of success and in some cases high rates of complications and reoperations. Nevertheless, these techniques continue to evolve and should be considered as options for patients with certain conditions that are particularly challenging to treat. Osteochondral allograft transplantation is a technique that over the past 15 years has been employed for treatment of osteochondral lesions of the talus (OLT) as well as for end-stage arthritis in young patients.1,2 The operation involves replacing injured, diseased or missing regions of bone and articular cartilage with matched specimens from a cadaveric donor. The goal is to restore a congruent articular surface with viable hyaline cartilage, and osteochondral allograft has several advantages over the alternative surgical treatments for both conditions. However, there are limited published results for these interventions, and level IV studies (case series) comprise the majority of the available evidence. Osteochondral allografts used in orthopedic surgery can be divided into three groups based on the methods of preparation and storage. These include freeze-dried, fresh-frozen and fresh, cold-stored.3 The fresh, cold-stored allografts are most commonly used for cartilage replacement techniques because this method supports the highest rates of cellular viability. Chondrocytes make up only 2% of mature articular cartilage by mass but cell viability is important in maintaining the extracellular matrix.4 Chondrocyte viability is largely dependent on duration of storage, which presents a logistical challenge in the use of fresh allograft products. Cell viability decreases by only 1.7% after 14 days, but 28.5% after 28 days.5 Animal studies have also shown poorer clinical results in transplants occurring at 28 or more days after harvest.6 However, in order to comply with regulations set forth by the American Association of Tissue Banks and the US Food and Drug Administration (FDA), tissue banks must hold specimens for the completion of serological testing, which is often greater than 14 days.7,8 Therefore, significant efforts have been made to optimize storage conditions and extend the viable storage life for fresh allografts. Allograft cell viability has been a significant concern in osteochondral transplantation, in large part due to the belief that recipient cells are unable to migrate and integrate into graft articular cartilage. There is evidence that this is an accurate assumption for osteochondral transplantation in the knee.9 Of note, this is not true for soft tissue allografts such as tendon, ligament, or meniscus, for which it has been shown that the cell content is gradually replaced by recipient cells following implantation.10 There is new evidence that in ankle allograft transplantations, recipient cells may integrate into the articular cartilage of the graft, presumably through migration through the subchondral bone.11 The authors of this work however, do not discount the importance of graft cell viability, as recipient cells are thought to incorporate into the deep layer of articular cartilage, but are absent in the superficial layers. Therefore, the donor cells remain crucial for maintenance of the cartilage matrix. Use of osteochondral allografts is considered to carry a low but nonzero risk of infectious disease transmission. Sterilization procedures are performed by tissue banks and include antibiotic baths, chemical cleanses, and gamma irradiation. However, sterilization techniques are nonstandardized, are often proprietary and must be balanced with the risk of compromising the biologic and structural properties of the graft.12 This underscores the importance of sterile technique in the procurement and storage process. Potential donors are risk-assessed and screened for HIV, hepatitis B, hepatitis C, human T-lymphotropic virus, and syphilis. Bacterial tissue cultures are obtained as well. Bacterial contamination of specimens occurs most commonly with Streptococcus or Bacillus species, and is more frequently reported for soft tissue allograft specimens than for osteochondral allografts.13 Rates of viral transmission are extremely low, with only two reported cases of HIV transmission, one case of hepatitis B virus transmission, and three cases of hepatitis C virus transmission.14 The estimated rate of HIV transmission is one in 1.6 million.15 Over the past decade, the American Association of Tissue Banks, FDA, and Joint Commission have increased regulations regarding allograft procurement, processing, and banking, including mandates for nucleic-acid screening for HIV and hepatitis C virus and strict protocols for incident investigation and reporting. Furthermore, the one patient without antibodies was a renal transplant patient on immunosuppressive medications, and notably had an excellent result. It has been argued that while the articular cartilage portion of an allograft is immune-privileged, the underlying bone is not and contains cells that can elicit an immune response.3,8 Another study treated a cohort of 57 patients with bipolar fresh osteochondral allograft, and the 16 patients who received a 6-month course of immunosuppressive therapy had faster recovery and improved clinical scores at 12 months.18 More investigation must be done to determine the clinical significance of the immune response to osteochondral allograft and the implications for the optimal management of transplanted patients. OLT describes a defect involving the articular cartilage and underlying subchondral bone of the talus, which is a common condition that can be challenging to treat19,20 (Figure 1). Surgical treatment options include debridement and bone marrow stimulation, autologous osteochondral transfers, autologous chondrocyte implantation (ACI), fresh osteochondral allograft transplantation, and use of articular cartilage allograft products. 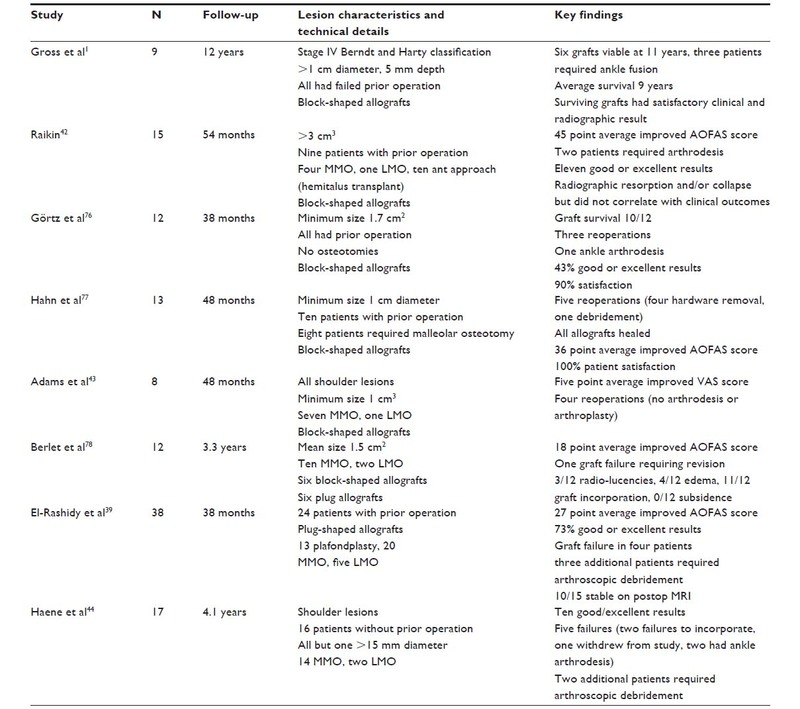 There have been no randomized-controlled trials comparing these methods and the treatment algorithm for OLT is controversial.21,22 Multiple factors including defect size, location, patient age, and prior surgeries must be considered. Figure 1 T1 magnetic resonance imaging appearance of a posteromedial osteochondral shoulder lesion. Bone marrow stimulation techniques, including microfracture and drilling, are commonly performed arthroscopically as the initial surgical treatment method for OLT (Figure 2). High rates of success (70%–90%) have been reported for small lesions;23–27 however some studies have shown higher failure rates for lesions greater than 1.5 cm2.28,29 These methods promote the influx of growth factors and mesenchymal stem cells to the cartilage defect and result in the production of fibrocartilage, which has inferior mechanical properties and durability compared to hyaline cartilage. In order to restore hyaline cartilage, alternative methods of cartilage transfer must be employed. Figure 2 Open exposure of a large medial talus osteochondral lesion (A), followed by curettage to expose subchondral bone (B), drilling to perforate the subchondral bone (C), final appearance prior to closure (D). Osteochondral allograft transplantation has a number of unique properties and is indicated in a certain subset of patients with OLT. In contrast to osteochondral autograft transfers, use of allograft entails virtually no limitations on overall size, width, depth, or shape. For example, there is no suitable autologous donor site for an uncontained shoulder lesion of the talus, and methods that do not restore the structure of the talus such as marrow stimulation techniques are ineffective. Generally, osteochondral autograft is not available in adequate quantities for lesions larger than 3 cm in diameter.31 For either of these types of lesions, osteochondral allograft is the most appropriate surgical option. Furthermore, osteochondral allograft eliminates the possibility of postoperative pain in the previously asymptomatic donor knee. 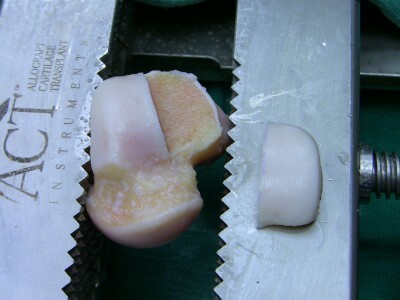 When using allograft, a single dowel or block of hyaline cartilage and bone can be fashioned to fill a defect, and there is no need for fibrocartilage to fill in between multiple circular plugs, as is necessary for autograft transfers using mosaicplasty technique. The surgical approach for osteochondral allograft transplantation is dependent on the size and location of the lesion. Relatively small, anterior-based lesions may be approached through either an anterolateral or anteromedial approach with or without the addition of a plafondplasty. Use of a plafondplasty allows access to the anterior 75% of the talus with plantarflexion.37 For larger, more posteriorly located, or lateral lesions, division of the anterior talofibular ligament with anterior subluxation of the talus or use of a lateral malleolar osteotomy may be necessary for access. Likewise, for posteromedial lesions a medial malleolar osteotomy is frequently performed. Very large lesions which involve a significant portion of the talus may require a hemitalus allograft transplantation. For this operation, a standard anterior approach to the ankle is necessary, utilizing the tibialis anterior-extensor hallucis longus or extensor hallucis longus-extensor digitorum longus interval. The addition of a cheilectomy of the anterior tibia as well as a universal distractor or temporary external fixator can improve the exposure (Figure 3). Figure 3 Anterior approach to ankle for hemitalus osteochondral allograft. Note: Temporary external fixator is used for distraction. Multiple options are available for graft preparation and fixation of osteochondral allografts. The custom fit method involves debriding nonviable cartilage and bone from an OLT and then fashioning a matching graft from a talus that has been size and shape-matched using a computed tomography (CT) scan of the recipient. The donor and recipient talus should be within 2–3 mm in size in both the sagittal and coronal planes.38 A press-fit is difficult to achieve with this technique, so buried, headless screws are used for fixation.1 An alternative method of grafting involves expanding the OLT with a cylindrical reamer, and then harvesting a cylindrical plug of the same size. The recipient bed is dilated, and the harvested plug is impacted into place.39 A press-fit can be achieved, and no additional fixation is necessary. A variation of this technique can be performed by impacting multiple smaller cylindrical donor plugs into a larger recipient site in a mosaicplasty fashion as is frequently done in osteochondral autograft transfer system procedures. For shoulder lesions or large central lesions, a semicylindrical reamer can be used from medial to lateral or lateral to medial via a malleolar osteotomy.40 The reaming is performed parallel to the talar dome to prepare the recipient site, and an analogous semicylindrical plug is harvested from the donor talus and impacted to achieve press-fit fixation. Finally for very large lesions, use of a hemitalus osteochondral allograft can be fashioned from the donor talus (Figures 4 and 5). Figure 4 Preparation of a fresh osteochondral lateral hemitalus allograft. Figure 5 Implantation of fresh osteochondral lateral hemitalus allograft with headless screw fixation through an anterior approach. The body of evidence supporting osteochondral allograft for OLT consists of several level IV evidence case series. Reported success rates are highly variable and depend largely on each author’s definition of success.41 The initial report of osteochondral allograft technique for talus lesions was by Gross et al in 2001.1 Out of nine patients with lesions greater than 1 cm in diameter, six allografts remained viable at an average of 11 years, while three patients had graft failure requiring ankle fusion. Only one of the six patients with surviving grafts had residual pain. Raikin reported on 15 cases of OLT with mean volume of 6.059 cm.3,42 At an average follow-up of 4.5 years, ten of 15 patients were noted to have graft collapse or resorption. However, this was not associated with clinical outcomes, as eleven of 15 patients had good or excellent results, and American Orthopaedic Foot and Ankle Society (AOFAS) scores improved by 45 points per patient. 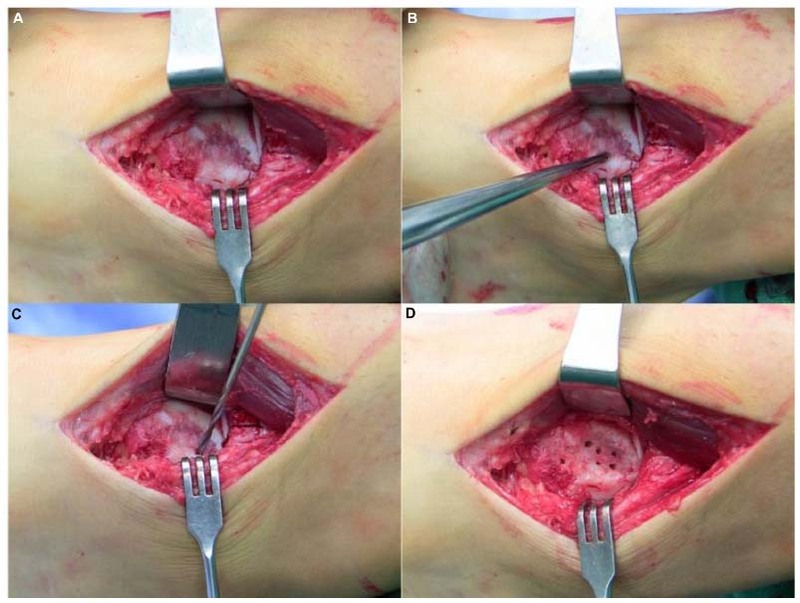 Adams et al reported on a series of eight patients treated with fresh osteochondral allograft for lesions of the talar shoulder.43 Medial or lateral malleolus osteotomies were performed and grafts were stabilized with headless screws. At an average of 48 months postoperatively, radiographic lucencies at graft-host interface were seen in five patients, and four patients required additional operations (none were ankle arthrodesis or total ankle arthroplasty). However, pain scores were decreased and the mean AOFAS Ankle-Hindfoot score was 84 points postoperatively. 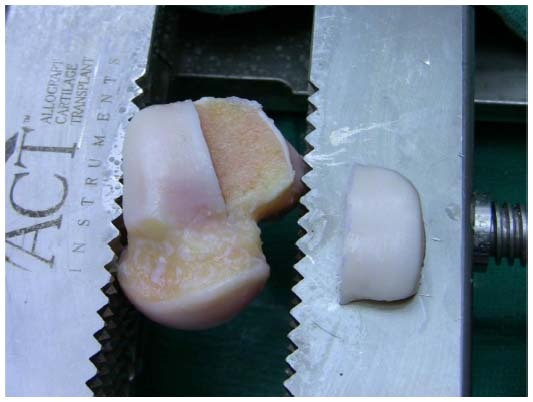 The largest study on fresh osteochondral allograft for OLT was performed by El-Rashidy et al.39 Thirty-eight patients presented with an OLT greater than 2 cm2, and were treated with a singular cylindrical plug, which was press-fit into the recipient bed. At an average of 38 months, there was a 73% rate of good or excellent results. There were four failures, which resulted in total ankle arthroplasty, ankle arthrodesis, or bipolar allograft ankle replacement. Haene et al reported on a series of 17 cases of OLT treated with fresh osteochondral allograft.44 Only ten of 17 cases had good or excellent results at an average follow-up of 4.1 years and five of 17 were considered clinical failures. An overview of the reported case series to date for fresh osteochondral allograft is summarized in Table 1. Abbreviations: AOFAS, American Orthopaedic Foot and Ankle Society; LMO, lateral malleolar osteotomy; MMO, medial malleolar osteotomy; MRI, magnetic resonance imaging; VAS, Visual Analog Scale. PJAC is indicated for small OLTs that have failed marrow stimulation techniques, or lesions larger than 1.5 cm. It can be used for uncontained shoulder lesions, but is contraindicated for use in large (>5 cm2), cystic, or necrotic lesions.45 Use of PJAC is a single-stage operation without risk of donor site morbidity. In some cases, the procedure can be performed in an all-arthroscopic manner, and even when an open approach is utilized, a malleolar osteotomy can often be avoided.50,51 Perpendicular access is not required for this procedure, and a tibial plafondplasty can provide adequate exposure for most lesions.43,45 The procedure is considered less technically demanding than OATS or osteochondral allograft because neither press-fit impaction nor screw fixation is necessary. Rather, the cartilage fragments are typically secured within the lesion using fibrin glue. Disadvantages for PJAC are similar to fresh osteochondral allograft including risk of infection, tissue rejection, allograft availability, and cost. Since PJAC is a relatively new technique for treatment of OLT, there are limited published results. The first report was a single case by Kruse et al in which DeNovo NT was used for a 0.7 cm posteromedial lesion of the talus.52 The patient returned to full activity at 6 months and was completely pain-free at 24 months. Giza et al reported on 23 patients with an average follow-up of 16.2 months.51 In all, 78% of the patients had a good or excellent result, defined by AOFAS Ankle-Hindfoot score greater than 80. It was noted that for moderate sized lesions (10–15 mm), good or excellent results were obtained in 92% of patients, but only in 56% of cases with large lesions (>15 mm). The goal of this procedure is to decrease joint pressures and allow for recovery of articular cartilage and subchondral bone. Another class of joint preserving operations includes realignment osteotomies, which can be performed in the setting of asymmetric arthritis associated with malalignment. Bipolar allograft transplantation, also known as total ankle allograft reconstruction, is a surgical option for young patients. The technique was initially developed as a treatment for knee arthritis and subsequently applied to the ankle.67 The goal of the procedure is to resurface both the tibia and the talus articular surfaces at the ankle joint using analogous fresh osteochondral grafts from a size-matched donor. Potential advantages of bipolar allograft compared to other operative methods include the preservation of bone stock, the maintenance of ankle range of motion and the limitation of secondary degeneration of adjacent joints. Disadvantages of the technique are related to the risks associated with fresh allograft, including transmission of disease and immunogenicity as discussed previously as well as the issues of allograft cost and availability. Data on outcomes for these procedures is limited to case series, and studies that have been published have reported relatively high rates of failure and reoperation. The ideal candidate for bipolar allograft is a young, active, nonobese patient, and most surgeons reserve this operation for those patients who refuse ankle arthrodesis.68–70 Any deformity or instability must be corrected either prior to or concomitant with the allograft procedure. Contraindications include large cystic lesions, noncorrectable deformity or instability, inflammatory arthropathy, infection, neuropathy and vascular disease. Preoperative evaluation includes a full weight-bearing series of the ankle and possibly a CT scan to assess the severity of cystic lesions. Plain radiographs or CT scan can be used to match an allograft donor of appropriate size. The operation is most commonly performed through an anterior approach to the ankle, utilizing the interval between the tibialis anterior and the extensor hallucis longus, although a lateral transfibular approach can be used as well.17,71 An external fixator is used for distraction and neutral alignment of ankle is confirmed on fluoroscopy. Total ankle arthroplasty cutting jigs are used for increased precision, and the Agility (DePuy Orthopaedics, Inc., Warsaw, IN, USA) system has most frequently used in published reports.69,70,72 The jig is positioned such that a 7–10 mm resection is made from the talus and tibia, and a 3–4 mm resection is made from the medial malleolus, taking care to avoid medial malleolus fracture and damage to the posteromedial neurovascular structures. A cutting jig one size larger is used to harvest the grafts from the donor specimen. Upsizing the jig makes up for bone loss that occurs secondary to the use of an oscillating saw, and allows for press-fitting of grafts.72 Graft thickness should be at least 7 mm, as thinner grafts have been associated with failure.2 Grafts are lavaged in order to remove immunogenic elements. They are then impacted and secured with screw fixation in the tibia and talus. Headless screws should be used in talus and countersunk beneath the anterior articular cartilage into the subchondral bone of the talar graft. Postoperative protocols typically involve initiating range of motion once wounds have healed, but restricting weight-bearing for at least 3 months following surgery. The initial report of bipolar fresh osteochondral allograft for ankle arthritis was out of San Diego in 2002, where the majority of published results on this operation have been produced. They reported on seven patients and reported a 42% failure rate at an average of 148 months.73 Failures were attributed to technical error, and in light of these results the authors implemented the use of total ankle arthroplasty cutting jigs. However, in the authors’ next series, even with the modified technique, five out of eleven operations were considered failures. 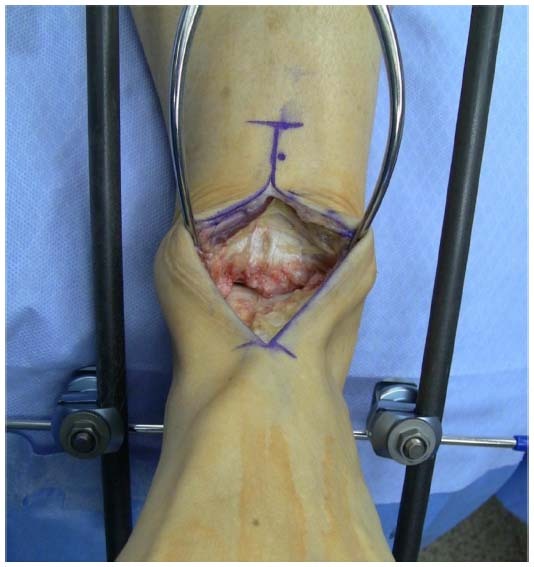 While there were no graft nonunions, seven of eleven patients required a reoperation, four of which were revision bipolar allograft or conversion to total ankle arthroplasty.2 The most recent case series by the same group (which included some of the previously reported patients) reported on 86 patients at an average follow-up of 5.3 years.68 They reported a 62% rate of good or excellent outcomes, though a 92% rate of patient satisfaction. Yet, there was still a 42% of reoperation and a 29% rate of allograft failure requiring revision allograft, total ankle arthroplasty, ankle fusion, or below knee amputation. Radiographic failures were noted in 46% of patients, defined as >50% joint space narrowing. It was noted that many of the radiographic failures were also clinical failures. Giannini et al located in Italy, have also published multiple case series on fresh bipolar osteochondral allografts for ankle arthritis. They first reported a series of 32 patients with a 31-month follow-up, for whom they performed bipolar allograft transplantation via a lateral approach.17 The study showed a significant improvement in AOFAS scores from 33.1 preoperatively to 69.5 postoperatively. They reported 53% good or excellent outcomes. Six patients had poor outcomes, and five patients required revision ankle arthrodesis. Of the patients with satisfactory outcomes, all had evidence of radiographic arthritis with varying degrees, but the extent of arthritis did not correlate with clinical outcomes. The same group subsequently published a series of 26 allografts performed via an anterior approach, with 41-month average follow-up.69 AOFAS scores improved from 26.6 preoperatively to 77.8 postoperatively. They reported six failures, and of these, three patients required ankle arthrodesis. In this series, the authors noted an association between allograft failure and tibial slope greater than 18 degrees. In both series, there was a low incidence of allograft collapse or fracture, and the authors emphasized the importance of their postoperative weight-bearing protocol which restricted patients for up to 6 months. Finally, two other case series have been presented or published by other groups. An unpublished series by Vora and Parks reported a 50% rate of failure in ten patients who underwent bipolar fresh allograft transplantation through a lateral approach.74 Lastly, Jeng et al reported on 29 patients with 2-year follow-up.70 14 of 29 patients required revision to repeat allograft transplantation, conversion to total ankle arthroplasty or bone block ankle arthrodesis. Six of the remaining 15 patients were deemed radiographic failures, leaving only nine cases that were considered successful. They concluded that allograft failure was associated with increased body mass index, increased patient age, and increased amount of preoperative coronal plane deformity. Fresh osteochondral allograft and other allograft products have a role in the treatment of ankle osteochondral lesions as well as ankle arthritis. These procedures have varying levels of success and reliability, but are reasonable to consider when other options are not feasible. In particular, large osteochondral lesions and those which have failed treatment with marrow stimulation techniques may be appropriate for use of allograft products. Large, cystic lesions or uncontained shoulder lesions may be best treated with osteochondral allograft transplantation. Lastly, young patients with end-stage ankle arthritis who refuse to consider ankle arthrodesis may warrant consideration of fresh bipolar allograft transplantation. Going forward, outcomes can be improved by innovation in surgical technique and instrumentation as well as through a better understanding of the relevant biology and immunology and optimization of perioperative protocols. Daniel J Fuchs has no conflicts of interest to disclose. Anish R Kadakia: AAOS, board or committee member; Acumed, LLC, IP royalties, paid consultant, paid presenter or speaker, research support. American Orthopaedic Foot and Ankle Society, board or committee member; Biomedical Enterprises, IP royalties; BME, paid consultant; Celling, paid consultant; Elsevier, publishing royalties, financial or material support. Journal of Orthopedic Surgery and Research, editorial or governing board; LWW, publishing royalties, financial or material support. Synthes, paid presenter or speaker; research support. Gross AE, Agnidis Z, Hutchison CR. Osteochondral defects of the talus treated with fresh osteochondral allograft transplantation. Foot Ankle Int. 2001;22(5):385–391. Meehan R, McFarlin S, Bugbee W, Brage M. Fresh ankle osteochondral allograft transplantation for tibiotalar joint arthritis. Foot Ankle Int. 2005;26(10):793–802. Winters BS, Raikin SM. The use of allograft in joint-preserving surgery for ankle osteochondral lesions and osteoarthritis. Foot Ankle Clin. 2013;18(3):529–542. Buckwalter J, Mankin H. Articular cartilage: tissue design and chondrocyte-matrix interactions. Instr Course Lect. 1997;47:477–486. Williams SK, Amiel D, Ball ST, et al. Prolonged storage effects on the articular cartilage of fresh human osteochondral allografts. J Bone Joint Surg Am.2003;85(11):2111–2120. Malinin T, Temple HT, Buck BE. Transplantation of osteochondral allografts after cold storage. J Bone Joint Surg Am. 2006;88(4):762–770. Görtz S, Bugbee WD. Fresh osteochondral allografts: graft processing and clinical applications. J Knee Surg. 2006;19(3):231–240. Sherman SL, Garrity J, Bauer K, Cook J, Stannard J, Bugbee W. Fresh osteochondral allograft transplantation for the knee: current concepts. J Am Acad Orthop Surg. 2014;22(2):121–133. Haudenschild DR, Hong E, Hatcher S, Jamali AA. Chondrogenic potential and homogeneity of cell populations of donor and recipient cells in a fresh osteochondral allograft. JBJS Case Connect. 2012(3):e17. Verdonk PC, Demurie A, Almqvist KF, Veys EM, Verbruggen G, Verdonk R. Transplantation of viable meniscal allograft. J Bone Joint Surg Am. 2005;87(4):715–724. Neri S, Vannini F, Desando G, et al. Ankle bipolar fresh osteochondral allograft survivorship and integration: transplanted tissue genetic typing and phenotypic characteristics. J Bone Joint Surg Am. 2013;95(20):1852–1860. McAllister DR, Joyce MJ, Mann BJ, Vangsness CT. Allograft update the current status of tissue regulation, procurement, processing, and sterilization. Am J Sports Med. 2007;35(12):2148–2158. Mroz TE, Joyce MJ, Steinmetz MP, Lieberman IH, Wang JC. Musculoskeletal allograft risks and recalls in the United States. J Am Acad Orthop Surg. 2008;16(10):559–565. Tomford WW. Transmission of disease through transplantation of musculoskeletal allografts. J Bone Joint Surg Am. 1995; 77(11):1742–1754. Boyce T, Edwards J, Scarborough N. Allograft bone: the influence of processing on safety and performance. Orthop Clin North Am. 1999;30(4):571–581. Langer F, GROSS AE. Immunogenicity of allograft articular cartilage. J Bone Joint Surg Am. 1974;56(2):297–304. Giannini S, Buda R, Grigolo B, et al. Bipolar fresh osteochondral allograft of the ankle. Foot Ankle Int. 2010;31(1):38–46. Giannini S, Buda R, Cavallo M, et al. Bipolar fresh total osteochondral allograft: why, where, when. J Bone Joint Surg Am 2014;96(8):e65. Berndt AL, Harty M. Transchondral fractures (osteochondritis dissecans) of the talus. J Bone Joint Surg. 1959;41(7):1363–1363. Kappis M. Weitere Beiträge zur traumatisch-mechanischen Entstehung der “spontanen” Knorpelablösungen (sogen. Osteochondritis dissecans). Langenbecks Arch Surg. 1922;171(1):13–29. Loveday D, Clifton R, Robinson A. Interventions for treating osteochondral defects of the talus in adults. Cochrane Database Syst Rev. 2010;(8):CD008104. Murawski CD, Kennedy JG. Operative treatment of osteochondral lesions of the talus. J Bone Joint Surg. 2013;95(11):1045–1054. Lee K-B, Bai L-B, Chung J-Y, Seon J-K. Arthroscopic microfracture for osteochondral lesions of the talus. Knee Surg Sports Traumatol Arthrosc. 2010;18(2):247–253. Becher C, Thermann H. Results of microfracture in the treatment of articular cartilage defects of the talus. Foot Ankle Int. 2005;26(8):583–589. Ferkel RD, Zanotti RM, Komenda GA, et al. Arthroscopic treatment of chronic osteochondral lesions of the talus long-term results. Am J Sports Med. 2008;36(9):1750–1762. Schuman L, Struijs P, Van Dijk C. Arthroscopic treatment for osteochondral defects of the talus. Results at follow-up at 2 to 11 years. J Bone Joint Surg Br. 2002;84(3):364–368. Chuckpaiwong B, Berkson EM, Theodore GH. Microfracture for osteochondral lesions of the ankle: outcome analysis and outcome predictors of 105 cases. Arthroscopy. 2008;24(1):106–112. Choi WJ, Park KK, Kim BS, Lee JW. 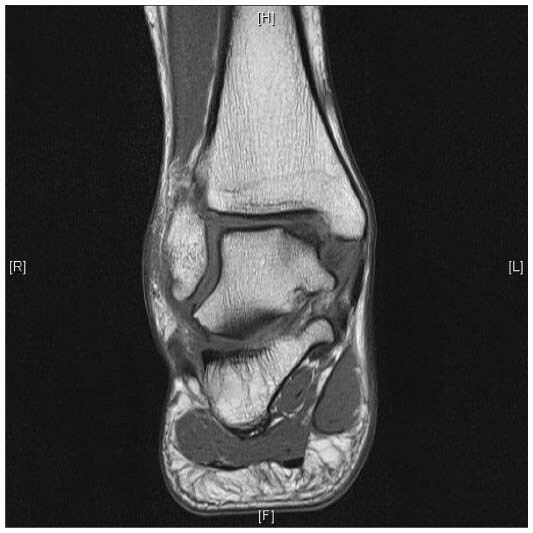 Osteochondral lesion of the talus is there a critical defect size for poor outcome? Am J Sports Med. 2009; 37(10):1974–1980. Giannini S, Vannini F. Operative treatment of osteochondral lesions of the talar dome: current concepts review. Foot Ankle Int. 2004;25(3):168–175. Kadakia AR, Espinosa N. Why allograft reconstruction for osteochondral lesion of the talus? the osteochondral autograft transfer system seemed to work quite well. Foot Ankle Clin. 2013;18(1):89–112. Hangody L, Kish G, Módis L, et al. Mosaicplasty for the treatment of osteochondritis dissecans of the talus: two to seven year results in 36 patients. Foot Ankle Int. 2001;22(7):552–558. Valderrabano V, Leumann A, Rasch H, Egelhof T, Hintermann B, Pagenstert G. Knee-to-ankle mosaicplasty for the treatment of osteochondral lesions of the ankle joint. Am J Sports Med. 2009;37 (1 Suppl):105S–111S. Koulalis D, Schultz W, Heyden M. Autologous chondrocyte transplantation for osteochondritis dissecans of the talus. Clin Orthop Relat Res. 2002;395:186–192. Giza E. Operative techniques for osteochondral lesions of the talus. Foot Ankle Spec. 2008;1(4):250–252. Giannini S, Buda R, Vannini F, Di Caprio F, Grigolo B. Arthroscopic autologous chondrocyte implantation in osteochondral lesions of the talus surgical technique and results. Am J Sports Med. 2008;36(5):873–880. Peters PG, Parks BG, Schon LC. Anterior distal tibia plafondplasty for exposure of the talar dome. Foot Ankle Int. 2012;33(3):231–235. Easley ME, Adams SB Jr, DeOrio JK, Nunley JA. Structural allograft reconstruction for large osteochondral lesions of the talus. Tech Foot Ankle Surg. 2011;10(4):148–158. El-Rashidy H, Villacis D, Omar I, Kelikian AS. Fresh osteochondral allograft for the treatment of cartilage defects of the talus: a retrospective review. J Bone Joint Surg Am. 2011;93(17):1634–1640. Dragoni M, Bonasia DE, Amendola A. Osteochondral talar allograft for large osteochondral defects: technique tip. Foot Ankle Int. 2011;32(9):910–916. Bisicchia S, Rosso F, Amendola A. Osteochondral allograft of the talus. Iowa Orthop J. 2014;34:30–37. Raikin SM. Fresh osteochondral allografts for large-volume cystic osteochondral defects of the talus. J Bone Joint Surg Am. 2009;91(12):2818–2826. Adams SB, Viens NA, Easley ME, Stinnett SS, Nunley JA. Midterm results of osteochondral lesions of the talar shoulder treated with fresh osteochondral allograft transplantation. JBone Joint Surg Am. 2011; 93(7):648–654. Haene R, Qamirani E, Story RA, Pinsker E, Daniels TR. Intermediate outcomes of fresh talar osteochondral allografts for treatment of large osteochondral lesions of the talus. J Bone Joint Surg Am. 2012; 94(12):1105–1110. Cerrato R. Particulated juvenile articular cartilage allograft transplantation for osteochondral lesions of the talus. Foot Ankle Clin. 2013; 18(1):79–87. Adkisson HD, Martin JA, Amendola RL, et al. The potential of human allogeneic juvenile chondrocytes for restoration of articular cartilage. Am J Sports Med. 2010;38(7):1324–1333. Liu H, Zhao Z, Clarke RB, Gao J, Garrett IR, Margerrison EE. Enhanced tissue regeneration potential of juvenile articular cartilage. Am J Sports Med. 2013:2658–2667. doi: 10.1177/0363546513502945. Bonner KF, Daner W, Yao JQ. 2-year postoperative evaluation of a patient with a symptomatic full-thickness patellar cartilage defect repaired with particulated juvenile cartilage tissue. J Knee Surg. 2010;23(2):109–114. Griffin JW, Gilmore CJ, Miller MD. Treatment of a patellar chondral defect using juvenile articular cartilage allograft implantation. Arthrosc Tech. 2013;2(4):e351–e354. Demetracopoulos CA, Adams SB Jr, Parekh SG. Arthroscopic delivery of particulated juvenile cartilage allograft for osteochondral lesions of the talus. Tech Foot Ankle Surg. 2014;13(1):39–45. Giza E, Delman C, Coetzee JC, Schon LC. Arthroscopic treatment of talus osteochondral lesions with particulated juvenile allograft cartilage. Foot Ankle Int. 2014;35(10):1087–1094. Kruse DL, Ng A, Paden M, Stone PA. Arthroscopic De Novo NT® juvenile allograft cartilage implantation in the talus: a case presentation. J Foot Ankle Surg. 2012;51(2):218–221. Clanton TO, Johnson NS, Matheny LM. Use of cartilage extracellular matrix and bone marrow aspirate concentrate in treatment of osteochondral lesions of the talus. Techn Foot Ankle Surg. 2014;13(4):212–220. Desai S. Treatment of osteochondral lesions of the talus with marrow stimulation and micronized allograft cartilage matrix: an all-arthroscopic technique. Tech Foot Ankle Surg. 2014;13(3):167–173. Desai S. Surgical treatment of a tibial osteochondral defect with debridement, marrow stimulation, and micronized allograft cartilage matrix – an all-arthroscopic technique: a case report. J Foot Ankle Surg. Epub September 5, 2014. Saltzman CL, Salamon ML, Blanchard GM, et al. Epidemiology of ankle arthritis: report of a consecutive series of 639 patients from a tertiary orthopaedic center. Iowa Orthop J. 2005;25:44–46. Thomas RH, Daniels TR. Ankle arthritis. J Bone Joint Surg Am. 2003;85(5):923–936. Coester LM, Saltzman CL, Leupold J, Pontarelli W. Long-term results following ankle arthrodesis for post-traumatic arthritis. J Bone Joint Surg Am. 2001;83(2):219–219. Fuchs S, Sandmann C, Skwara A, Chylarecki C. Quality of life 20 years after arthrodesis of the ankle. A study of adjacent joints. J Bone Joint Surg Br. 2003;85(7):994–998. Thomas R, Daniels TR, Parker K. Gait analysis and functional outcomes following ankle arthrodesis for isolated ankle arthritis. J Bone Joint Surg Am. 2006;88(3):526–535. Bonnin M, Gaudot F, Laurent J-R, Ellis S, Colombier J-A, Judet T. The Salto total ankle arthroplasty: survivorship and analysis of failures at 7 to 11 years. Clin Orthop Relat Res. 2011;469(1):225–236. Kofoed H, Lundberg-Jensen A. Ankle arthroplasty in patients younger and older than 50 years: a prospective series with long-term follow-up. Foot Ankle Int. 1999;20(8):501–506. Saltzman CL, Mann RA, Ahrens JE, et al. Prospective controlled trial of STAR total ankle replacement versus ankle fusion: initial results. Foot Ankle Int. 2009;30(7):579–596. SooHoo NF, Zingmond DS, Ko CY. Comparison of reoperation rates following ankle arthrodesis and total ankle arthroplasty. J Bone Joint Surg Am. 2007;89(10):2143–2149. Easley ME, Adams SB, Hembree WC, DeOrio JK. Results of total ankle arthroplasty. J Bone Joint Surg. 2011;93(15):1455–1468. Barg A, Amendola A, Beaman DN, Saltzman CL. Ankle joint distraction arthroplasty: why and how? Foot Ankle Clin. 2013;18(3):459–470. Meyers M, Akeson W, Convery F. Resurfacing of the knee with fresh osteochondral allograft. J Bone Joint Surg Am. 1989;71(5):704–713. Bugbee WD, Khanna G, Cavallo M, McCauley JC, Görtz S, Brage ME. Bipolar fresh osteochondral allografting of the tibiotalar joint. J Bone Joint Surg Am. 2013;95(5):426–432. Giannini S, Buda R, Pagliazzi G, et al. Survivorship of bipolar fresh total osteochondral ankle allograft. Foot Ankle Int. 2014;35(3):243–51. doi: 10.1177/1071100713518503. Jeng CL, Kadakia A, White KL, Myerson MS. Fresh osteochondral total ankle allograft transplantation for the treatment of ankle arthritis. Foot Ankle Int. 2008;29(6):554–560. Bugbee WD, Brage ME. 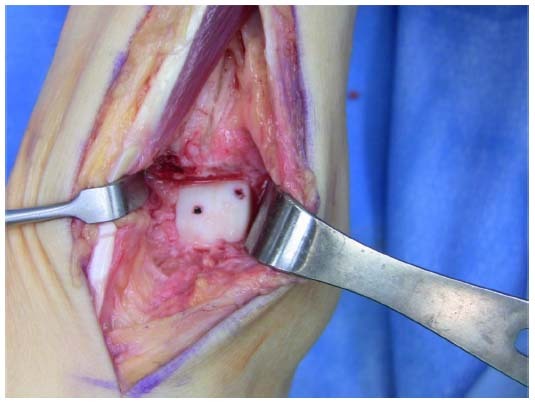 Bipolar osteochondral allograft transplantation of the tibiotalar joint for ankle arthritis. JBJS Essential Surgical Techniques. 2014;4(1):e3. Tontz WL, Bugbee WD, Brage ME. Use of allografts in the management of ankle arthritis. Foot Ankle Clin. 2003;8(2):361–373. Kim CW, Jamali A, Tontz W, Convery FR, Brage ME, Bugbee W. Treatment of post-traumatic ankle arthrosis with bipolar tibiotalar osteochondral shell allografts. Foot Ankle Int. 2002;23(12):1091–1102. Vora A, Parks B. Early failure of bipolar osteochondral tibiotalar allograft replacements. Paper presented at: Annual Meeting of the American Academy of Orthopaedic Surgeons (AAOS); 2005. Raikin SM. Stage VI: massive osteochondral defects of the talus. Foot Ankle Clin. 2004;9(4):737–744. Görtz S, De Young AJ, Bugbee WD. Fresh osteochondral allografting for osteochondral lesions of the talus. Foot Ankle Int. 2010;31(4):283–290. Hahn DB, Aanstoos ME, Wilkins RM. Osteochondral lesions of the talus treated with fresh talar allografts. Foot Ankle Int. 2010;31(4):277–282. Berlet GC, Hyer CF, Philbin TM, Hartman JF, Wright ML. Does fresh osteochondral allograft transplantation of talar osteochondral defects improve function? Clin Orthop Relat Res. 2011;469(8):2356–2366.